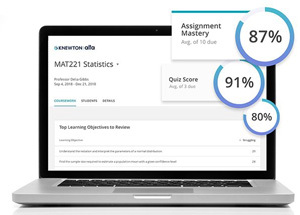 Ed tech company Knewton has launched a collection of digital courseware that integrates its adaptive technology with open education resources, with the intention of selling directly to instructors and students. Previously, the company licensed its adaptive functionality to textbook publishers for integration with their course content. Under the new strategy, the company noted, it could own "all aspects of the user experience" and "make a greater impact on outcomes and affordability." Each title in the new line costs $44 for two years of digital access. The Knewton Alta line has already released 33 textbooks covering math, statistics, reasoning, economics and chemistry. The content for the books comes from multiple sources. For example, the Alta Microeconomics curriculum used material from OpenStax, UC Irvine Open Courseware and Knewton's own subject-matter experts. The company noted that the content, technology and user experience are all WCAG 2.0 AA-level ADA compliant. The technology also follows the common cartridge standards for learning management system integration and is backed by 24/7 Knewton support for both students and instructors. Each course assignment in Alta is tied to learning objectives specified by the instructor. When students struggle during an assignment, the adaptive technology diagnoses the learning gap and recommends instructional content as well as an assessment customized to help them achieve mastery of the objectives. Faculty gain views into student progress through a dashboard. To measure Alta's impact on mastery of content, Knewton reviewed the results of 10,000-plus students who used the new curriculum while it was being developed. The company found that students using Alta before mastering the learning objectives scored an average of 55 percent on course assessments. Students who achieved mastery scored an average of 81 percent. Among those who struggled to complete an assignment, 82 percent eventually reached the mastery level. "Students and instructors have been taken for granted by textbook publishers for too long. They deserve a better experience at a more affordable price," said Knewton CEO Brian Kibby, in a press release. "We designed every aspect of Alta to empower instructors to put achievement within reach for their students, from its affordability and accessibility to its ability to help all learners achieve mastery." For more information, visit the Knewton site.